OMG… you guys…. how is this series in the YA section!!?!?!?!? Chapter 2…. CHAPTER FREAKING TWO!!!!!!!!!!!! 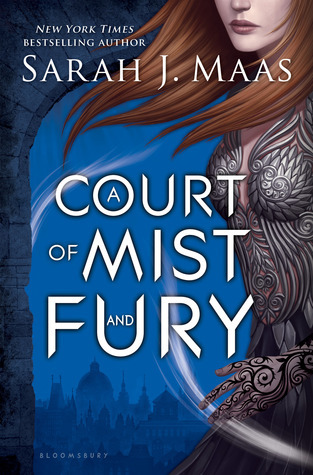 Okay… freakout over; so, let’s talk about A Court of Mist and Fury. I have been sharing my new book knowledge with all of my coworkers because I don’t think any of us understood the extent of the maturity level, even after reading the first book. There would have been a major spit-take moment if my boss was drinking anything when I showed her the second chapter in this book. Her eyes got so wide I was worried they would pop right out of her head. Synopsis: After Feyre’s dramatic and traumatic face-off with the evil Amarantha, she doesn’t really feel like the smiling faerie princess that everyone wants her to be. She’s finally able to be with Tamlin, but he seems determined to keep her locked away “for her own safety” even though it is driving her insane. After three months with no word from Rhysand, everyone begins to think that he won’t come to collect her for their deal, until he suddenly appears in the middle of a rather important ceremony to whisk her away. And although Feyre isn’t sure he can be trusted, she’s suddenly feeling more free than she has since coming back from under the mountain. Okay, yeah, I get it now. I get the hype… I get the Tamlin-hating mob… I get the obsession. And now I’m just one more fangirl longing for the third book in the series. Sarah J Maas has done an amazing job with this series, and has somehow managed to avoid the dreaded “second book slump” by creating an even more powerful story than the first book. The continued character and world building in A Court of Mist and Fury far surpasses anything that I’ve seen in a YA series, or any series, in a long time. We’ve finally moved away from the formulaic Beauty and the Beast story and we’ve moved into an epic fantasy world where the line between good and evil is blurry and unsure. I love it! In all honesty, I was getting really annoyed with Feyre at the beginning of this book. The strong and independent girl from the first book turned into this whiny child who complained about everything. I get that she was traumatized during her time under the mountain, but she spends so much time complaining that she’s not allowed to do anything while simultaneously letting others speak and act on her behalf. She wants to be allowed to do things, but refuses to even attempt to take charge of the things she does have control over. It’s hardly surprising that everyone assumes she needs to be coddled and protected when she can barely dress herself. So, my “ship” from ACOTAR didn’t pan out, but I’m not entirely unhappy with the way things turned out. Although I still think that Lucien would have been an awesome love interest for Feyre, especially since he is one of the few fey who seem to take her seriously, I understand that Maas had a different plan in mind for the two of them. I’m really curious to see what happens next because Tamlin’s possessiveness has become a huge problem for everyone, including his best friend. Lucien was so passive throughout this book and it kind of drove me crazy. Both Feyre and Tam were obviously going a bit crazy, and he’s just like “oh yeah, well I guess it’s okay as long as everyone is still alive.” If Lucien takes an active role to work against Tam then we are going to see some serious drama soon. If you haven’t had a chance to read these books yet, you are really missing out. This is one of the best series I’ve encountered in a while. The night I finished this book I had so many dreams about it, which has basically never happened to me. My brain was trying to figure out what would happen next, where the story would go, and I just couldn’t stop thinking about it. So bravo, Ms. Maas! Same happened to me. At first I was like, Oh Hell no, Tamlin is great, he would never turn into such a douche, but she did build it up to that and in the end, it did make sense. So now I’m totally team Rhys and Feyre. Can’t wait for the next one!